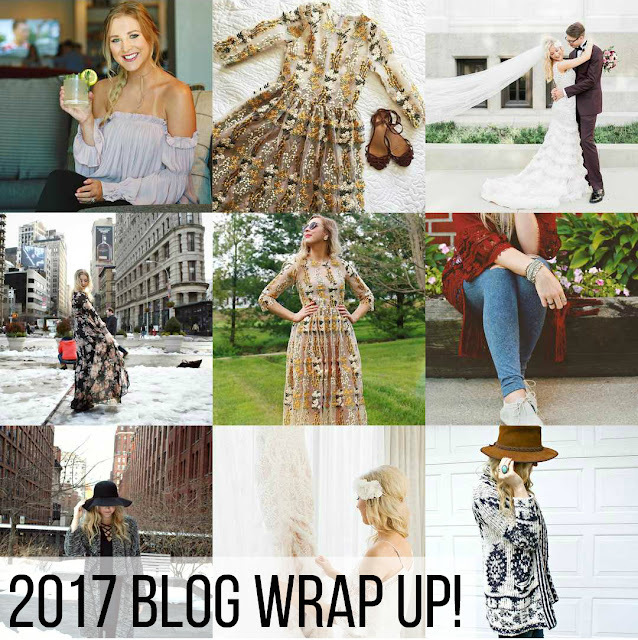 Lifestyle | Goodbye 2017, Hello 2018! I always love the fresh start of a new year. I also always make way too many resolutions! I really enjoy reflecting on the past year and refocusing on bettering myself for the new year. It's another chance to grow as a person and enjoy each coming day! I'm thankful for the lessons that I learned and the blessings that I received in 2017. I had the best Christmas and holiday season ever this year however, I'm ready to say hello to 2018! 2017 came with many challenges for me. I ended the year a whole lot better than I started. I started off 2017 the sickest I'd ever been with my Colitis. The first couple months of the year, there were many nights spent sleeping on a pile of blankets on our bathroom floor. I would wake up to get sick multiple times throughout the night and I was too weak to walk back and forth from my bed to the bathroom. I also didn't want to disturb Fred a good 8+ times every night while he was trying to sleep. None of my colitis symptoms were under control. They were spiraling and I was getting worse and worse every day. Right after New Year's, I got sick with the flu. I don't ever remember feeling worse than that battling both out of control Colitis and the flu. New York Fashion Week came in February. We almost didn't go because of how poorly I felt. Fred knew it was one of my goals and dreams to be a part of Fashion Week so he did everything he could to get me there. He booked the hotel and worked a full day of work before packing up the car and driving us to NYC. I was sick the entire drive, but we did it! It was definitely one of the highlights of my year. I will never forget that week and our memories made there. The Yuna Yang show was truly inspiring. Spring brought a lot of healing for me. I had been working with a new doctor since October of 2016 to find a treatment plan. In our last effort for a treatment plan that didn't involve a more serious choice, my doctor prescribed me one last plan. I started the treatments and also started juicing cabbage and drinking it every day and I added a few new natural supplements to my plan. I finally started seeing results after 2 1/2 long years of flaring! In the summer, I started having more and more good health days. I got to go home to my parents in June and my sister was also there visiting. We had a really fun week together while Fred was in Japan for work. One of my favorite memories from 2017 was my birthday scavenger hunt from Fred that he did for me while he was in Japan. I also treasure the days that I got to spend working by the pool. I could get used to that! We went to Sunset Beach with Fred's family. The beach was beautiful and we had a lot of fun times there on and off the beach! Fall came and went quickly, but it was a great season! We got to do all of the fun fall things that we love. We went to the pumpkin patch, drank cider (multiple times haha), ate pumpkin everything, and attended my sister-in-law's annual Halloween party. We dressed up as Scooby-Doo & Shaggy this year! We also went on a trip to Rochester, New York and it was one of the best weeks of the year for me. We got to sightsee and try lots of yummy food. We also got to see Niagara Falls while we were there! Then the holiday season started for us. It's always my favorite time of year. This year though was the best Christmas season I've ever had! Fred and I had some very special Christmas dates leading up to Christmas and even 1 after. We got a white Christmas. I felt the best I've felt in 4 Christmases, so I got to do a lot more things with our families! We built gingerbread houses twice, which I love to do. We went sledding on Christmas day! We did a walking advent calendar outside with my family and it was very special. I got so many special Christmas gifts from my family and friends. I got to spend a week with my sister who loves out of state. We visited my favorite spots in my hometown and ate all of the food that I've missed! We had a red carpet New Year's Eve party with my family and I'm sure there's a lot more that I'm missing! I'm so thankful to end the year on such a warm, positive, and healthy note. If you'd like to see my blog roundup from last year, you can see it here! Cheers to making 2018 the best year yet! The Lord's arm is not too weak to save you, nor His ear too deaf to hear you call.